When it comes to hair loss treatments, people often think of either expensive surgeries like hair implant, or commercial treatment with shampoos and other products. Very rarely do we put our trust in home remedies which are in fact cheaper, and safer too. One such remedy is apple cider vinegar. And this is not a new kid on the block. Apple cider vinegar has been around for centuries. In fact, I started using apple cider vinegar for weight loss and for improving my digestion system. It helps cure acid reflux disease too. I drink cider vinegar twice a day, after diluting a couple of teaspoons in a cup of water. It detoxes my body, improves digestion and I feel fresher. Apple cider vinegar is acidic – it contains 5% acidity. So you may want to dilute cider vinegar before using it on your hair, though I have heard from many people who use cider vinegar without diluting it. Take a 500ml mug or jar. Fill it up half with warm water and half with cider vinegar. That’s your apple cider vinegar hair rinse. Fill it up in a bottle dispenser. I use a sprinkler bottle. Now wash your hair with shampoo as you usually do. Shed excess water from hair. You may want to lightly dry up hair with towel, which is optional. Apply cider vinegar hair rinse. Work cider vinegar into the scalp. This is where it is needed the most. Leave it on for a couple of minutes and wash it off. Take care to avoid cider vinegar getting into your eyes. It many cause burning sensation. If cider vinegar manages to make its way in your eyes, wash them off with cold water. Here’s a variation to the process. 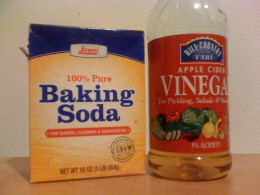 Some people prefer to add a spoon of baking soda to the ACV hair rinse. This provides extra shine and also helps in cleaning up dandruff. Remember, use of baking soda may cause excessive dryness and make your scalp itchy. As such, use baking soda only once a month, and follow it up with some hair oil. 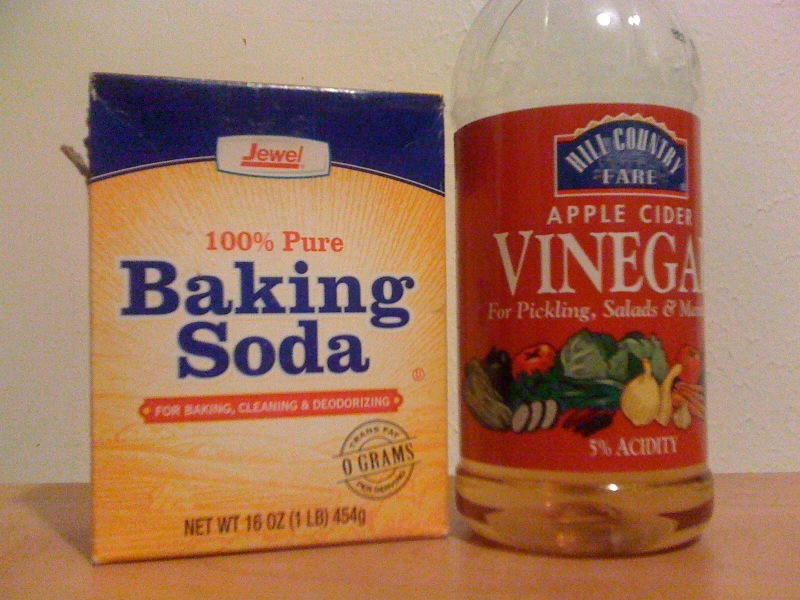 I prefer not to use baking soda because my scalp is dry anyway, and cider vinegar is sufficient to remove chemical build up from the scalp. Apple cider vinegar works at many levels in improving the quality of hair as well as the health of your scalp. Cider vinegar also contains malic acid which is another ingredient for removing fungal as well as bacterial infections. The most important benefit of cider vinegar is its ability to balance pH factor of hair: Human hair should ideally have a pH factor of between 4 and 6. Cider vinegar has Shampooing typically increases pH factor. Human hair is acidic, with a pH factor of 4 to 6. Shampooing your hair regularly strips them off their acidity. Apple cider vinegar, with its pH factor of about 4, helps in restoring the pH balance of our hair. Cider vinegar makes hair smoother, and addresses the problem of split hair. Cider vinegar’s ability to remove chemicals from the scalp helps in solving the issue of scratchy scalp. Healthier scalp promotes new hair growth. Because of its anti-bacterial and anti-fungal property, apple cider vinegar can provide a good remedy for hair loss diseases like Alopecia. Can I use white vinegar instead? White vinegar used for cooking is different from apple cider vinegar. So the answer is no – you shouldn’t use white vinegar if you wish to get healthy hair. Apple cider vinegar is specifically manufactured to contain ‘mother’ of vinegar – it is the muddy floating object that you will see in the bottle. This mother contains the nutrients and enzymes you need for it’s health value. This is why it is important to choose the right apple cider vinegar from the market. What you should be looking for is unpasteurized, unfiltered apple cider vinegar. If it is made from organic apples, even better. Organic apples are free from pesticides. The leading brand of organic cider vinegar is Bragg. Bragg source their organic apples mostly from within the United States and therefore are more confident about the quality of apples used in making cider vinegar. Organic cider vinegar is worth the money you spend on it, considering how much money we spend on commercial products laden with chemicals. Also, apple cider vinegar is versatile and has many more uses – see the end of this article. Some people prefer powder cider vinegar instead of liquid cider vinegar. I don’t know whether the powder cider vinegar is effective. I use liquid cider vinegar because I can see the ‘mother’ of vinegar in it. OK, a bit of a history of hair loss. We don’t lose hair overnight unless caused by Alopecia or some other hair disease. Hair loss occurs over a period of time, usually a couple of years, mostly because of stress, diet, water and environmental conditions. As such, stopping hair fall is not possible with a quick fix solution. It takes time, and changes to lifestyle. What apple cider vinegar does is offers the possibility of a healthy scalp, so that when our immune systems is naturally ready to encourage hair re-growth, it has a healthy environment available which is conducive to reducing hair fall, and encouraging new hair growth. I have been using cider vinegar for less than a year now, and have seen marked difference in the quality of my hair. It has slowed down hair fall, and I have shiny hair. I can almost feel a healthy scalp as there is not itchiness and dryness anymore. I follow the cider vinegar treatment with almond oil application so as to prevent dryness. As an aside, I have thrown away commercial conditioners, because I like the natural hair treatment with apple cider vinegar. I would recommend using cider vinegar once or twice a month only. So if you wash your hair more often, then you may still want to use a conditioner. Cider vinegar is a lifetime habit. You would want to continue to use cider vinegar regularly to protect your hair from harmful radicals and maintain a natural shine. Cider vinegar hair rinse is not known to have any adverse side effects. It is a natural product free of chemicals, and is good for your hair. These easy-to-follow tips will help you reduce hair fall, and get shiny hair. Should I use cider vinegar for hair? Each person’s body-disposition is different. The effectiveness of apple cider vinegar may vary from person to person. You may want to try cider vinegar hair rinse for a few months, and see if it works for you. It has worked for me. In fact, I could feel the difference the very first time I washed my hair with cider vinegar. Apple cider vinegar is not just helpful for your hair but also for your overall health. People have successfully used cider vinegar to treat acne and pimples. Cider vinegar is also effective in shedding extra pounds and losing weight over a period of time. Weight loss benefits are achieved by increasing metabolism rate. Have an ACV drink every day and keep doctor away. Apple Cider Vinegar diet is a natural way to lose weight without side effects. It’s also a very easy to follow routine for weight loss. Get started with this guide for losing weight with Apple Cider. How may time in a week i will apply aaple cider vinegar on scalp? ?